In the latter half of the twentieth century, The American upper class has become less like an aristocracy governing and guiding the nation and more like a caste, a privileged and closed body whose contribution to national leadership has steadily declined. 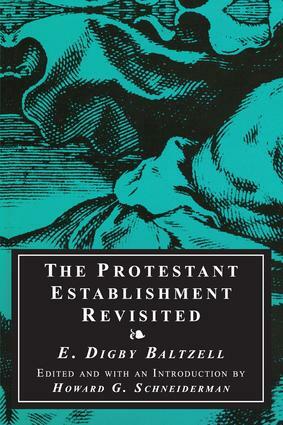 This loss of power and authority has been the focus of the work of E. Digby Baltzell, whose 1964 work, The Protestant Establishment, analyzed the fate and function of a predominantly Anglo-Saxon and Protestant upper class in an ethnically and religiously heterogeneous democracy. After 27 years, Baltzell's theory of the structure and function of the establishment remains unique in the literature of class stratification and authority. Baltzell views an open and authoritative establishment as a necessary and desirable part of the process of securing responsible leaders in a democratic society. Such an establishment is the product of upper-class institutions that are open to talented individuals of varying ethnic and social backgrounds. The values of upper-class tradition include an aristocratic ethos emphasizing the duty to lead, as opposed to the snobbish ethos of caste that emphasizes only the right to privilege. Baltzell regards this as a protector of freedom in modern democratic societies, guaranteeing rules of fair play in contests of power and opinion. As Baltzell points out, historically, the alternatives to rule by establishments have been, rule by functionaries and demogogues, neither of which has proven satisfactory in protecting freedoms. As against Marxists, who see hegemony as a social evil, Baltzell, following Tocqueville, sees it as necessary to the well-being of society. Hegemonic establishments give coherence to the social spheres of greatest contest. They do not eliminate conflict, but prevent it from ripping society apart.